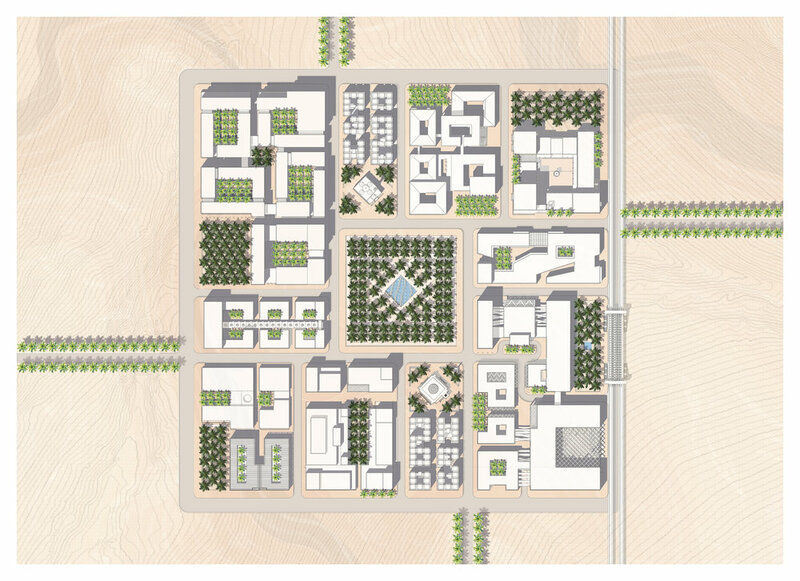 ABU DHABI MEDICAL VILLAGE, 2018: "OASIS" Despite being designed for a site-less location in Abu Dhabi, this proposal for a Medical Village is nevertheless influenced heavily by place as the warm temperatures and intense sunlight in Abu Dhabi present many obstacles for design, but also many opportunities. Our first design decision was to group the buildings close to one another, using the massing of each to help shade the streets and sidewalks. Second, we organized each programmatic function of the complex around a series of courtyards. This approach reduces the depth of the individual buildings, allowing them to cross ventilate and be naturally lit by the powerful sun. It also ensures that every hospital room, office, and classroom will have views to the exterior. The courtyard spaces are linked to one another through narrow passageways animated by native vegetation and the overhead bridges that connect the internal corridors through many of the buildings. These passages will likely become the primary circulation system of the campus. The automobile is limited in access to the perimeter of the eleven blocks in the plan as well as the numerous entrances to the underground parking structure. Fostering a walkable environment while not inconveniencing car travel is a core principle of the design. This approach allows employees and visitors to quickly move from building to building and supports a social atmosphere at the level of the sidewalk. 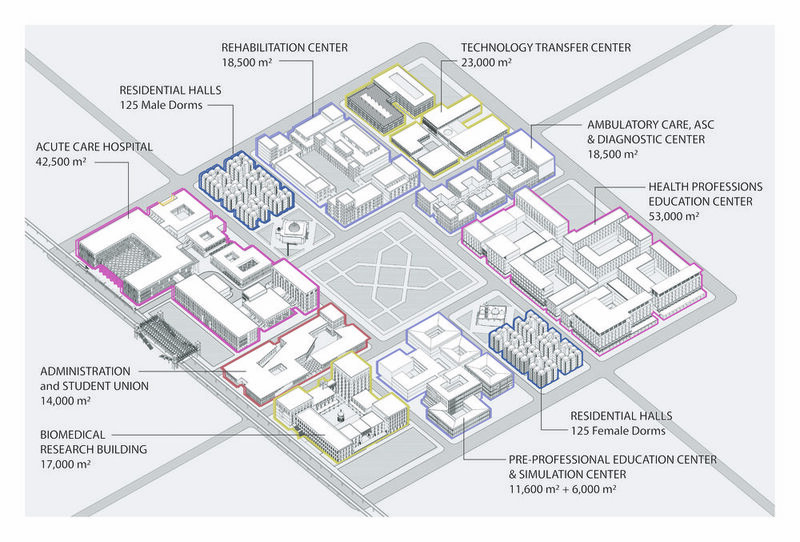 The plan of the campus is organized using a variation of the pinwheel shape forming a square with dimensions of 400m x 400 m. The sizes of each block correspond to each programmatic function. The tallest buildings are seven stories, the lowest are two. 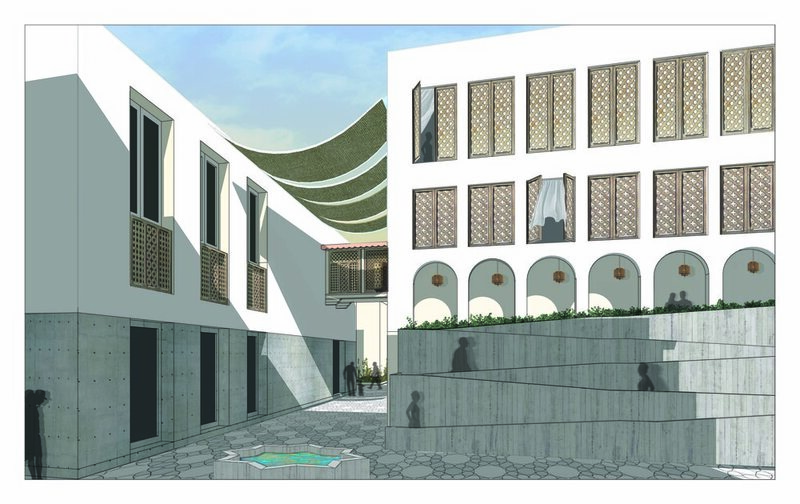 In addition to the finer-grained network of courtyards, the plan also incorporates several larger palm courts near the boundaries of the campus as well as two conveniently located mosques. The primary focus of the plan is a lush garden of densely planted palm surrounding a reflective pool. This serves not only as the geographic center of the plan but also a metaphorical one. An oasis of sorts, the garden is geometrically arranged with a traditional Islamic pattern of walkways, allowing for an ordered yet dynamic park experience. The garden and pool are the lungs of the campus, breathing health back into the patients and providing a calming wayfinding devise for visitors. The garden in turn is seemingly protected by the heavy walls of the surrounding buildings that screen the garden from strong winds or sandstorms. This symbiotic relationship between the natural and the manmade underscores the ability we have to balance environmental sensitivity with the life-saving and life-enhancing technology contained within the buildings.